If you aren't signed up for Influenster yet, let this post be a message loud and clear: SIGN UP! It is awesome! Everything I'm showing you I got completely for free because I share these products with you. 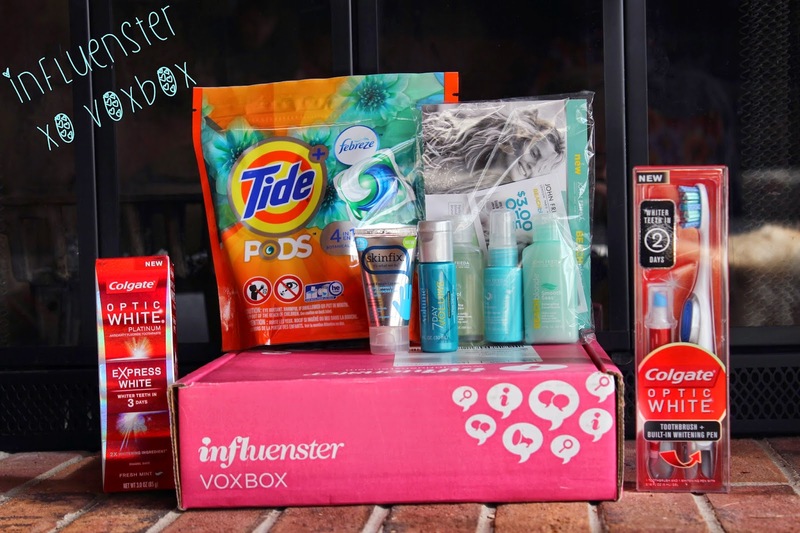 Every couple months I get something new from Influenster and the boxes are always great. (See here, and here for some examples) Basically, you get to sample some cool products in exchange for a review. It's awesome! To sign up, just click here. I was excited to see a big bag of Tide Pods with Febreze! I like the convenience of pods for laundry, and even though these aren't the most natural, I'll use them since I got them for free! Also included is the John Frieda Luxurious Volume 7 Day Volume In-Shower Treatment. This is a lightweight, semi-permanent treatment that lasts for several washes. It's meant to penetrate each fiber of hair and amplify each strand. This is a unique item that that's totally new to me and I'm looking forward to trying it! Next to the treatment is a set of three hair items. These are the shampoo, conditioner and sea salt spray from the John Frieda Bleach Blonde collection. I don't really know why these are labeled "beach blonde" as they don't say anything about making your hair blonder, or preserving your color. Which I guess is good because we all know I'm nowhere near being beachy or blonde. As for sea salt sprays, I have yet to meet one that does anything special for me - but I do like using them for texture when I use hot rollers in my hair. For those of you with dry hands, you'll love Skinfix Hand Repair Cream. This lotion is unscented and highly moisturizing. It's formulated without steroids (that's a thing in lotion??! ), soy or fragrance. This is advertised to be great for people with eczema, dermatitis or extreme dryness. I prefer lotion with a teensy bit of a smell, but this is a nice option. And who doesn't love free toothpaste and a toothbrush? I'm all about free necessities. Included in this box are Colgate Optic White Express White toothpaste and the Colgate Optic White Toothbrush with built-in Whitening Pen. I've used this toothpaste before and it's just fine, and I've never tried this fancy toothbrush before. All in all, I think this was an awesome VoxBox - probably one of the best I've received. All items will definitely get used and are things I wouldn't have picked up myself but I'm pumped to try. Let me know if you've tried any of these products. And seriously... if you read all the way through this and STILL haven't signed up - WHAT ARE YOU WAITING FOR?! Awesome free stuff awaits you.